I visited the annual exhibition of the Contemporary Watercolour Competition run by the Royal Watercolour Society on Friday. The exhibition continues until 16th March at the Bankside Gallery (right next to Tate Modern and the River Thames on the South Bank. You can see a virtual exhibition here on the RWS website. This has hugely improved in terms of the page of works, and each work also having its own page (click image and then click "detail page" to access) which then invites people to share work. This is the standard all shows should aspire to! This was the Call for Entries (last Autumn) for those interested in a future submission. Blogs posts about previous exhibitions are also listed at the very end of this post. 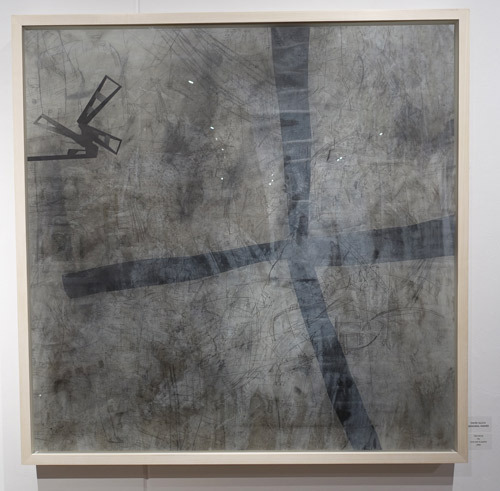 The exhibition has a strong emphasis on "contemporary artwork'. 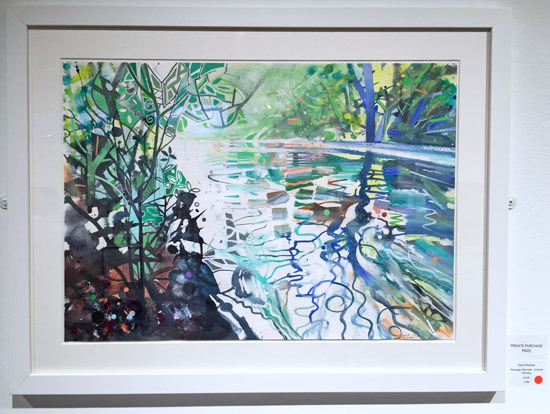 The judges are looking for pieces that push at the boundaries of watercolour, promote water-based media at its most accomplished and ask audiences to see the medium in a new and contemporary light. 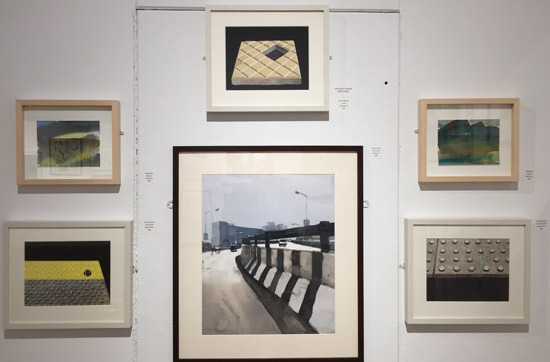 I've not been impressed with this exhibition in the recent past and have said so - in no uncertain terms (see Review: RWS Contemporary Watercolour Competition 2015 and in 2013). However this competition and exhibition seems to have turned the corner. I can only imagine that the very low level of sales in 2015 would of itself have prompted a review of whatever the selection panel had been trying to do in the past. 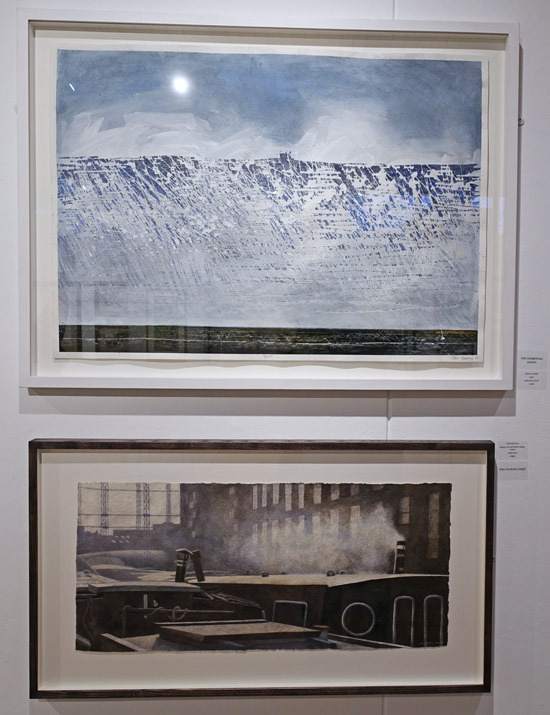 I've included some views of the works on display above and below. I think I'd sum it up as 'better editing and much better variety of subjects and styles but still has scope to do much better'. I'm saying that based on shows I've seen in past years. This year there was more representational art which brought a better balance to the show - with fewer "abstract" and "bad paintings" - which is a good thing! However that is not to say I think that every painting deserved to be in the show. There again that's a comment most of us can make about most juried shows! This is one of the main routes to elected membership of the Royal Watercolour Society BUT I'm still looking for the successors to painters like Leslie Worth and David Prentice - who were outstanding in their vision of what paintings can be about and their techniques and handling of the 'proper' watercolour medium. However I'm not seeing them in this show. I don't expect to see the mature version of such painters - but I would like to see much more ambition in the basic handling of pure watercolour! Frances Chapman looks to me to being the nearest to being somebody who may well become a member - if she applies. 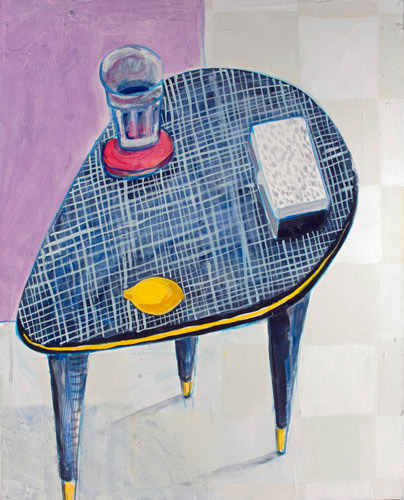 She has a unique and very distinctive style and demonstrates considerable understanding of colour and technical skills as well as producing paintings which are interesting. I've seen her work before (she's consistently selected for the Sunday Times Watercolour Competition) and it's always excellent . Definitely one to watch - and, should she choose, whichever band of watercolour artists she joins will have an asset! Bruise Bar by James Albon - it's a really refreshing change to see somebody drawing narrative scenes involving people in pure watercolour. We see too few. I'm still underwhelmed by the majority of portraiture in watercolour - and I know there are some fabulous portrait painters in watercolour - so why don't they enter? The thing about exhibitions is that, IF one has the money, you can put on an exhibition which aspires to be whatever you want an exhibition of work in media which dissolves in water to be. However if you remember that art society exhibitions started off with the sole intention of displaying work so that it could be sold so that artists could make some money and carry on being artists then one has to ask "Does the current selection/exhibition support the aspirations of the artistic fraternity who want to work in water soluble media?" My answer to that would still be 'No it does not' and that is based on what appears to continue to be a very worrying low level of sales compared to other shows - notwithstanding a number of the works LABELLED as winning prizes sold (of which more later!). I only ever remark on sales when they are very good or very bad. This exhibition does not finish until 16th March but the evidence I saw on Friday afternoon would suggest that this exhibition is unlikely to have done well on the sales front given the time profile for most sales. Maybe that's because there aren't enough paintings of the type people like to buy? 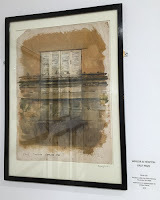 One of the things which I found extremely odd was that the painting by Vince Bridgeman, one of the runners up for the Winsor & Newton prize, had been removed from the wall. 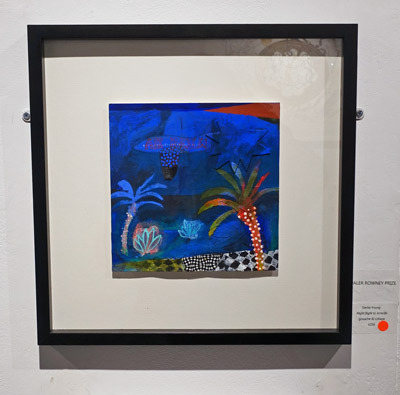 Apparently it had sold and the artist had agreed it could be removed from exhibition by the buyer who was returning overseas and wanted to take it with them. In all my years of reviewing art exhibitions associated with art competitions and national art societies I have never ever come across this happening. I don't imagine Winsor & Newton will be very pleased either! 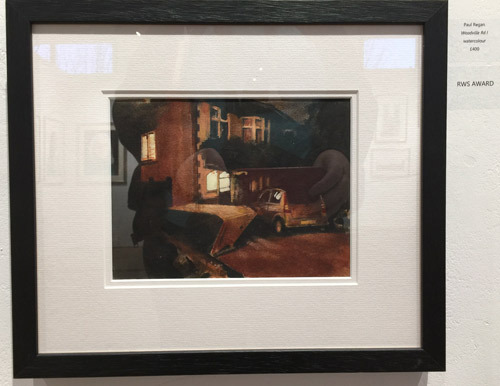 To compound the issue, the small painting which actually won the Winsor & Newton First Prize is located in an absolutely dreadful position - suffering double reflections - and it's impossible to appreciate properly. At the very least the now gaping space on the opposite wall could at least have been filled by the W&N First Prizewinner! If there's a rationale to the thinking behind the prizes awarded I've not found it. Normally one has an explanation of what the prize is and what it is for - but I can find nothing on the RWS website. To be honest I thought I understood which works had won which prizes - but I may be wrong! I got hold of the list of prizewinners from the front desk and then carefully logged which works on the wall had the prizewinners label placed next to them. 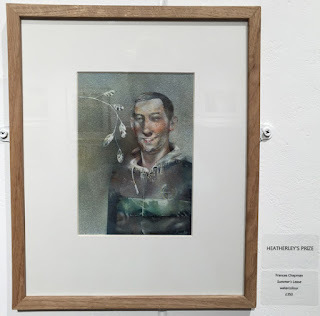 I then became totally confused when I sat down to wrote this blog post and saw the photos of "the prizewinners" on the RWS Facebook Page and found that a totally DIFFERENT set of paintings were being highlighted if the painter had painted more than one work. If the Prize is for an artist rather than a work then this needs to be explicit and transparent in the labelling. If both paintings win a prize then in my view both paintings need a label - otherwise the artist can miss out on a possible sale to people who like prizewinners! How much does it cost to print an extra label? Putting a label on one in the Gallery and the same label on another on Facebook is just plain CONFUSING!! Changing the artist's name also does not help. What's even worse to an artist trying to develop a following is to have artwork labelled with one name in the gallery and on the selected artists list - and with another on the website. As has happened to Polina Klimova/Egorushkina. I don't know what's going on. Maybe the RWS or Bankside Gallery would care to explain? Anyway - that's by way of a very long explanation for why what follows are the ones which had labels next to them in the Gallery - and NOT the ones which are labelled as such on Facebook! The RWS Exhibitions Prize goes to a very interesting painting which I stared long and hard at. I still can't quite work out how Andrew Lansley achieved the surface he has with just watercolour and ink. It's so odd that a watercolour artist who has a website with a lot of interesting, vibrant and colourful work should feel the need to enter a virtually monochromatic work. There again her colourful work has been selected previously - and she seems to have a track record of winning a prize most years. Maybe she just wanted to demonstrate that her paintings are also interesting when there is no colour? This painting won two prizes and was featured on the Private View Card, the banner, the poster and in online marketing of the exhibition. It's a very striking image. There's always a prize which puzzles. I wasn't quite sure of the rationale for this painting winning a prize. It's a nice enough painting and I'm not saying it shouldn't have been selected but I'm just not sure what made it special. This one grew on me. Something to do with the sense of isolation at night in a tower block - even though people are above, blow and on both sides. I also liked the subtle use of blue in with the black and white. She has two paintings and both looked very good displayed toegther. The gallery labels "Sleep" as the prizewinner. The website labels "Empty" as well. It's just plain confusing - and irritating. She's also got a completely different name on the website. Is it too much to ask to get the name right in both places - or to use the one which the artist now uses for her website? (Note: I've gone with the name on the RWS website and her website and not the one on the list of selected artists or the one on the label in the gallery). 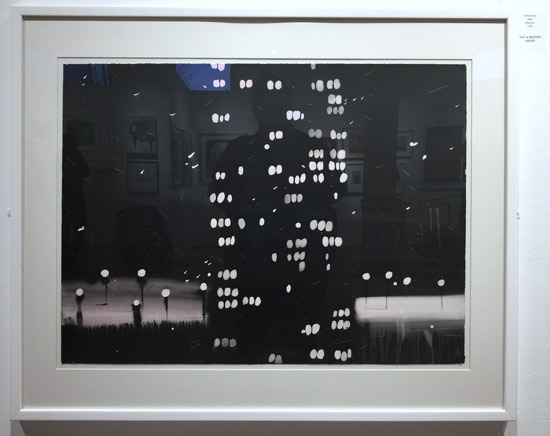 This is important because this artist won a prize for excellence at the Shenzhen Watercolor Biennale in China. This is an artist to keep an eye on - but only if people get the name right! This one puzzled me a lot. I do think it's an impressive piece of art. However I don't agree with its selection for this show because of the proportions in the media used - in an art competition about contemporary watercolour! I use polyester drawing film, conte, graphite, charcoal, retouching varnish, wax crayon, carbon paper, collage, conte wash and water stain. I'm all for a competition which explicitly invites "pieces that push at the boundaries of watercolour, promote water-based media at its most accomplished". 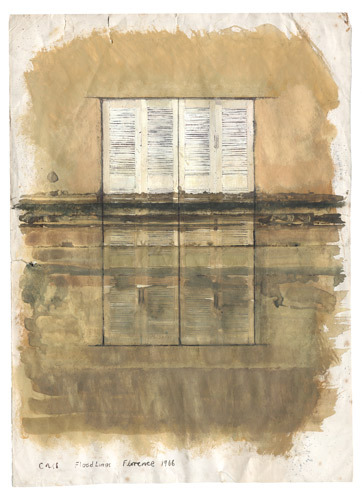 However to my mind this painting "works" because of the line work in graphite (drawn not painted) - and this represents a very significant proportion of the artwork. Take it away - to get back to the water based washes derived from graphite and conte and you have a VERY different picture. Put simply, my understanding of water-based media does not yet stretch to include lots and lots and lots of line work using graphite pencils or sticks. It's an issue of balance. I think this is another one to add to my list of works which win prizes but don't conform to the brief. A lively, colourful and calligraphic painting! 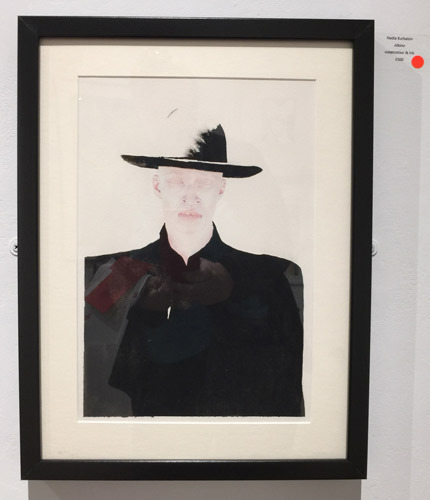 I liked it a lot - especially as it was hung adjacent to its 'pair' - which was unlabelled - but on the website as the winner. David Wiseman has been painting for over 35 years since leaving the Royal College of Art in 1975 most spent in his garden studio close to the local rivers, woodland and canal he loves and that inspire his work. 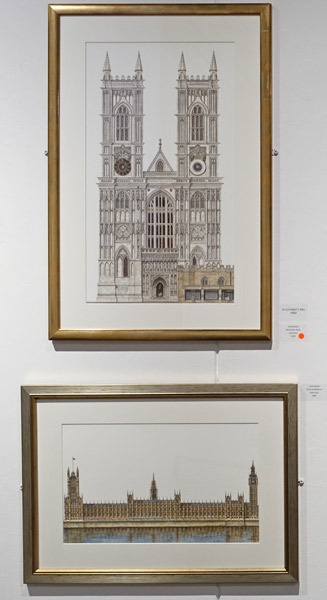 Vashia Bhatia had two watercolour paintings selected which are both very precise and very impressive renditions of the iconic West Door facade of Westminster Abbey and the riverside profile of the Houses of Parliament. To be honest it was impossible to see this painting properly. It suffered from a double set of reflections. Other exhibitions move prizewinners to a better place after the announcement - why not this one? See also my comment under "A very odd thing"
It would appear that this prize was for both paintings - not that you'd know it in the gallery! This was a really delightful small work - full of well executed pointillist technique, excellent draughtsmanship - and not a little humour! I liked it a lot - and would love to see more work on a larger scale. I very much recommend taking a look at this artist's website. Click the link in the name above. 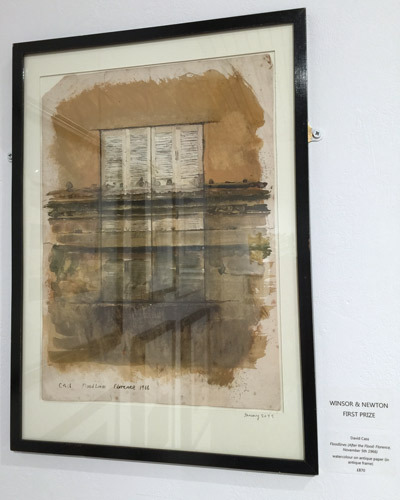 I wonder if all three paintings would sell as a set if those visiting the gallery knew that all three paintings by Antonia Banados had won her a prize? Maybe next time she'll frame them as a triptych? You can download the list of works which includes the media used and the price - but not the size. John Crossley (Associate RWS Member). 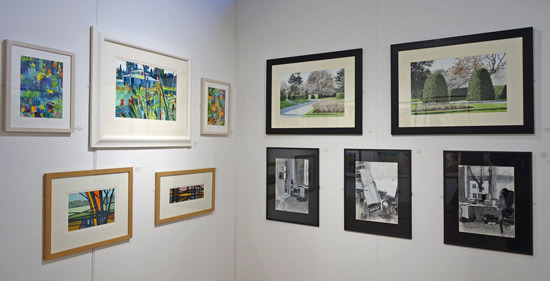 RWS Contemporary Watercolour Competition 2013 - Making a Mark Overview of the terms and conditions of the call for entries for UK & international artists.